Have a potential future cadet in the family? Deciding whether the Army Reserve Officers’ Training Corps (ROTC) program is right for you? Already in the program? Study up on the Army ROTC program before you or someone you know steps foot in the classroom in a crisp uniform. Download the ROTC Handbook from the U.S. Army Cadet Command to help learn this new culture—acronyms, Army-isms and all. 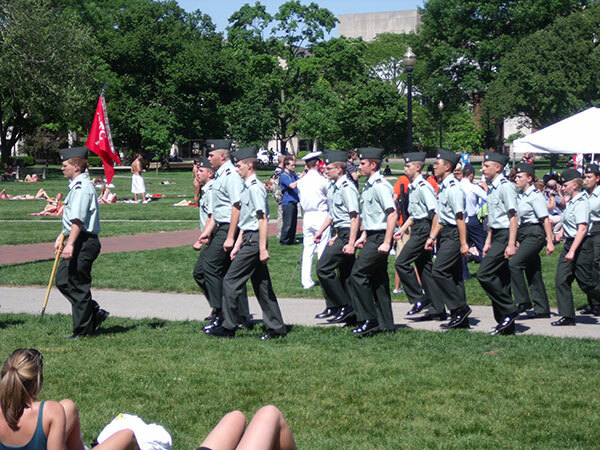 This app serves a wide audience, including those who are looking to join the program, current cadets and anyone who is interested in cadet life. 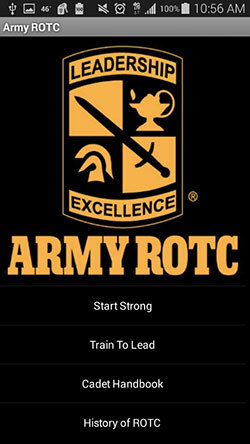 For future cadet candidates, the app contains enrollment information as well as scholarship information. Learn about off-campus training opportunities, including specialized training schools such as Airborne and Air Assault, and cultural immersion trips to other countries. For current cadets, the app contains an incredible amount of handy reference material, including uniform information, rank and ribbon information, and the army values. The app also features specialized schools available for cadets during the summer or winter, internship information and more. The app is available for Android devices. It was published in mobile format in partnership with Combined Arms Support Command’s Technology Integration Branch in Ft. Lee, Virginia. You can download this and other cool mobile government apps with just a few clicks from our USA.gov Federal Mobile Apps Directory. Federal agencies can get their apps in the directory by using the The Federal Mobile Products Registry.